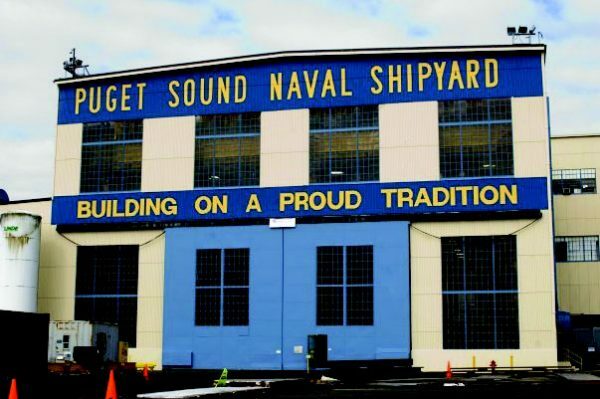 Puget Sound Naval Shipyard (PSNS) – is located adjacent to the city of Bremerton in Western Washington (approximately 30 miles northwest of Tacoma). The site is bordered on the south by the Sinclair Inlet, and on the north and east by the City of Bremerton. Building 460 was built in 1940-1941 and was used to repair and upgrade battleships during World War II. It is a ﬁve story building with a footprint covering ﬁve acres, a total exterior surface area of 178,000 sq.ft., and 426,000 sq.ft. of interior work space. 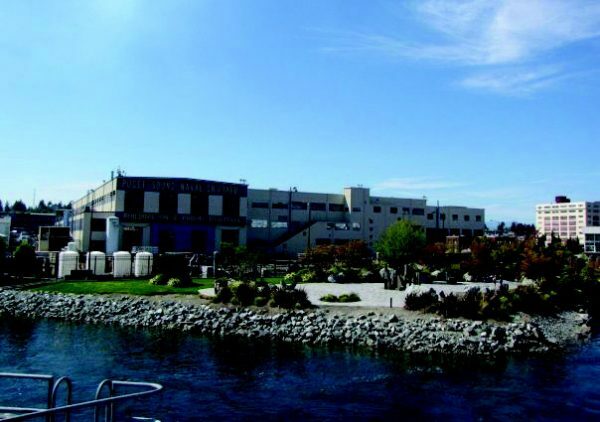 Building 460 is immediately noticeable by those arriving to the area by ferry, and as it is located near the Shipyard’s fence line with the City of Bremerton, it is highly visible from Harborside Fountain Park. 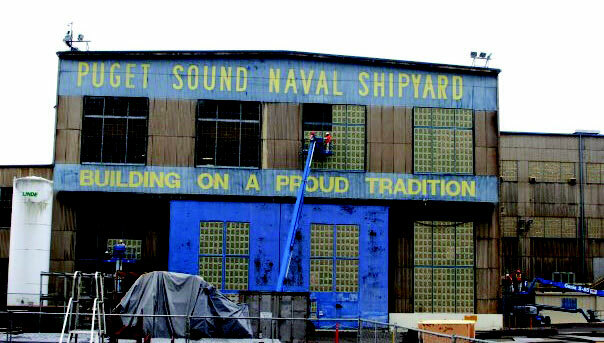 Building 460 serves as the home of the shipyard’s shipﬁtters, welders and apprentice school. In 1992, the structure was designated a National Historic Landmark. The exterior of Building 460 consists of cementitious structural siding panels (Transite®) that contain asbestos. Lead-based paint is present on the frames of 27,800 window panes. The paint dated to the original oil-based coatings applied after construction in 1941. By 2009, colors had faded, and paint was delaminating. The siding was chalking, powdery, and in some places, friable. In an August 8, 2009 article, the local Kitsap Sun wrote that “Puget Sound Naval Shipyard’s monstrous building 460 used to stick out like a sore thumb on the Bremerton waterfront”. Wind off the water – Continuous south-westerly winds, with gusts ranging from 15-30 mph. Fog and Precipitation – Fog is common in the morning presenting concerns for visibility as well as necessitating careful monitoring of moisture levels. Rain is also a constant threat and schedules have to adapt to probable and actual precipitation. Temperature – Cool morning and evening temperatures require attention to ensure surface temperatures are above 45 degrees. Heat also poses a challenge. Temperatures in late afternoon can be upwards of 100 degrees. Heat and stress levels for employees must be monitored, extra hydration provided, and at times, work needs to avoid the hottest times of the day. Marine Air and Salt Accumulation – Removal of moss, algae, salt and other particulates prior to application of any coatings. Cost Savings – Original estimates to remove the lead paint and install new siding were projected to be $6.2 Million. Including both materials and labor, the application of encapsulating coatings systems was estimated at a little over $2 Million. Safety in the Certiﬁed Industrial Area (CIA) – Safety was paramount for both Sabelhaus employees and the employees of PSNS. All work would be performed in an occupied area of an active Navy facility with minimal disruption. A Certiﬁed Industrial Area on a U.S. Navy facility is a special access area requiring special training and multiple checkpoints for access. Historical – A primary goal of this exterior restoration was to match the original color scheme of the building from 1941. Over 4,600 gallons of coatings would be applied to 178,000 square feet, and each color needed to be a careful match to the original hues. A coatings manufacturer would need to be identiﬁed that could both produce encapsulation sealants with the requisite approvals and certiﬁcations, but which also possessed the skillset to match color precisely, and ensure consistency throughout multiple production runs. Sabelhaus West and their preferred product supplier, Kelly Moore Paint, turned to Fiberlock Technologies, Inc. of Andover, MA for a cost effective, permanent system of solutions for the challenges posed by the aged lead and asbestos-containing exterior surfaces. 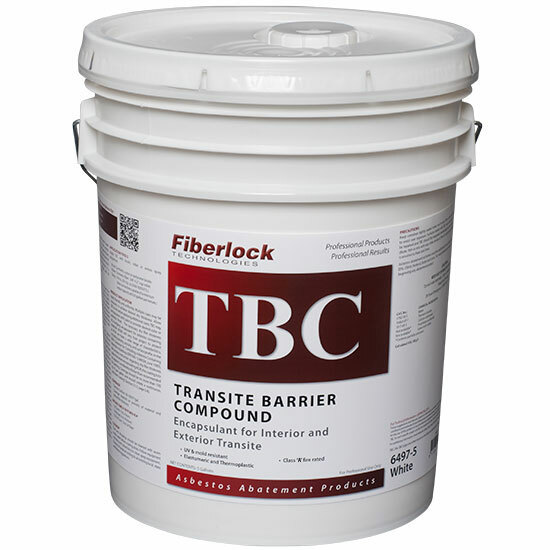 Fiberlock’s solution involved three key products: Grip-Tack™ – an adhesive lockdown surface preparation treatment; T-B-C Transite Barrier Compound™– an elastomeric co-polymer encapsulant formulated for the management of asbestos in place; and, L-B-C Lead Barrier Compound® – Type III (Interior/Exterior) – the encapsulant for lead-based paint most widely speciﬁed and used in the U.S. Both encapsulants (T-B-C and L-B-C) would be custom tinted in manufacturing to match the original 1941 colors of the building. Other than some decorative finish coating, the encapsulants would provide both encapsulation and the Navy’s required color and finish, thus eliminating the material and labor expense that would have been involved in additional topcoats of ordinary paint. All three products could contribute as well to LEED (Leadership in Excellence in Environmental Design) credit 4.1 as low emitting materials. Prior to encapsulation all surfaces had to undergo necessary preparation. Decades of marine salt accumulation, scattered areas of mold and mildew, decaying and friable siding, and peeling paint all needed to be addressed. Special care was exercised to contain any asbestos or lead particulates released during the washing process. A customized water/debris containment system was implemented utilizing a 1000 gallon reservoir to store wash water collected by sump pumps [A 10/18/09 press release touted that 31,500 gallons of water were saved due to conservation and recycling efforts]. This attention to water and waste collection avoided contamination of natural waterways in accord with EPA, state, local, and U.S. Navy guidelines. Another innovative approach utilized in the cleaning phase: fire hydrants were utilized to feed all the power washing equipment by using pressure reduction adapters. Broken windows and areas needing replacement siding were marked and repaired as the cleaning process was underway. Following cleaning, all 27,800 window panes were masked prior to coating application with airless sprayers. First applied was GripTack. 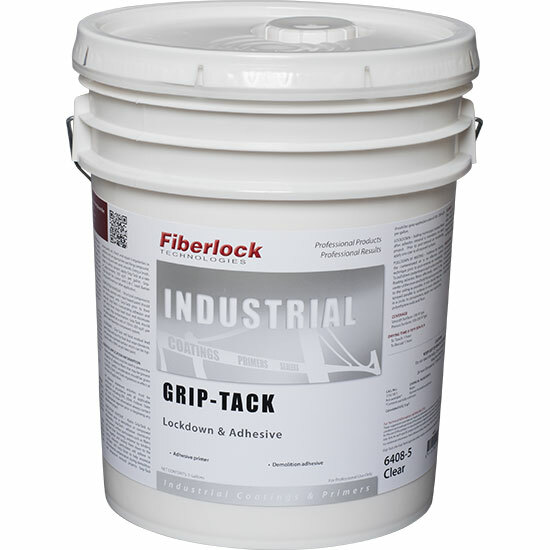 Originally developed as a safeguard that can help prevent release of potentially harmful particulates during demolition, GripTack is a coating used for multiple purposes during remediation projects. 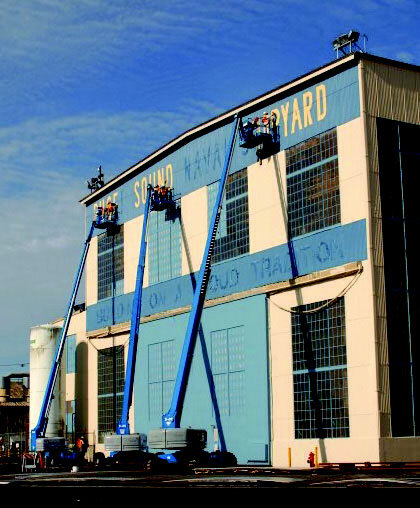 For Building 460, GripTack was the initial treatment for both the lead painted window components and the asbestos containing structural siding. On the lead-based paint, GripTack served as an adhesive to maintain the soundness of the prepared paint, and prevent “running edge” minor delaminations that can occur after pressure washing. On the asbestos siding, GripTack was performed as a masonry conditioner for these cementitious substrates. Age and time had yielded chalkiness and surface powdering that could interfere with adhesion of any topically applied coating. The low-viscosity but high-solids formulation of GripTack enabled penetration where possible, and by imparting resin, enhanced the matrix integrity of aged substrate materials. Sabelhaus then applied two applications of T-B-C to the body of Building 460 to yield a dry fi lm thickness of 14 mils. This application thickness is in congruence with the EPA Guidance for Controlling Asbestos- Containing Materials in Buildings” (EPA-560/5-85- 024), which recommends dry fi lm thickness of no less than 100 sq. ft./gal., and application in accord with anticipated exposure and environmental conditions. A co-polymer with elastomeric and thermoplastic components, T-B-C offers flexibility to resist future cracking from building movement and seasonal temperature variations. At no additional cost, Fiberlock custom tinted the T-B-C to a color, “Softer Tan”, as provided by Kelly-Moore Paints, to match the original body color of Building 460. Fiberlock was able to deliver the custom tinted T-B-C in only 10 days – vital to keeping the project on schedule. To address the lead-based paint on over 27,000 window panes at Building 460, Sabelhaus applied two coats of L-B-C Lead Barrier Compound – Type III (Interior/Exterior). 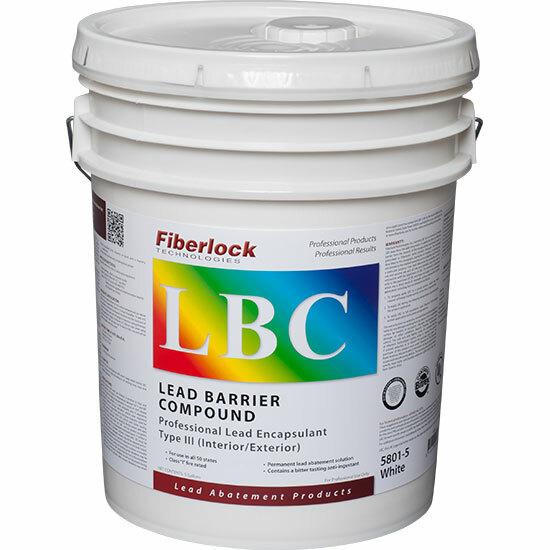 Since 1993, Fiberlock Technologies, Inc. has been the recognized industry leader in the development and manufacture of encapsulants for lead-based paint, and L-B-C is the most widely specified and used lead encapsulant in the U.S. Acceptable for indoor and outdoor use in all 50 states, L-B-C was independently tested to the ASTM E 1795 protocol required by U.S. EPA and HUD – a rigorous battery of 22 tests evaluating 15 different aspects of coating performance (including weathering, flexibility, adhesion, impact resistance, etc.). While paint is not acceptable as an abatement method in the U.S. for lead based paint, encapsulation with coatings that have surpassed ASTM E 1795 and offer a 20 year warranty provides abatement as valid as removal, enclosure or component replacement. 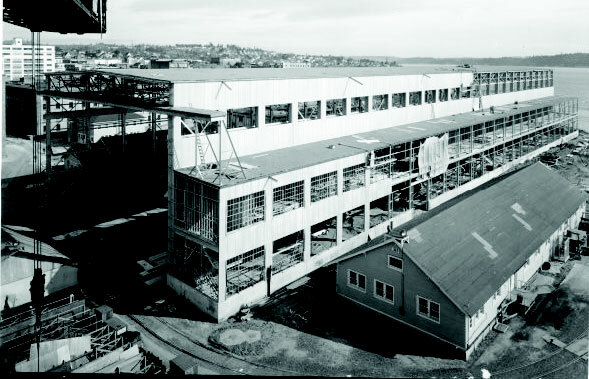 For such a large structure with so many windows, and with historic restoration as a key goal, encapsulation offered the Navy an opportunity to both address the lead-based paint and return Building 460 to the 1941 appearance within a reasonable budget and schedule that would have been unmanageable with removal, replacement, or enclosure. Fiberlock produced close to 1,000 gallons of L-B-C tinted in manufacturing to “Leisure Blue”. This color, as supplied by Kelly-Moore paint, brought back the original vivid contrast of the prominent doors and windows with the building structure. Sabelhaus applied the L-B-C to a dry fi lm thickness of 14 mils utilizing a combination of brush, roller and airless sprayer. 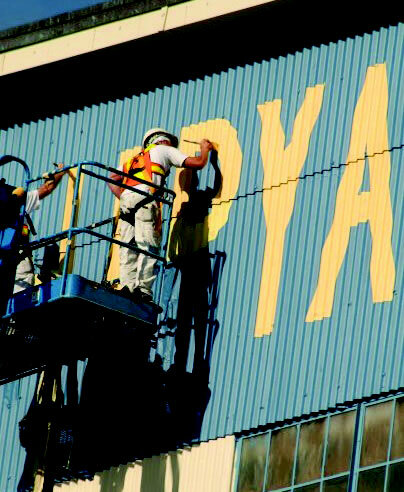 The final touch: Repainting the huge and locally famous gold lettering and background on the façade. For this crowning stage in the massive facelift of Building 460, custom water-based acrylic topcoats tinted to “Classical Gold” and “Down Pour” were supplied by Kelly-Moore Paints. Building 460 was restored ahead of schedule and all parties were extremely satisfied with the results. Through teamwork and a great working relationship between the Navy, General Contractor, Sabelhaus, Kelly-Moore and Fiberlock the end result could have not been better. 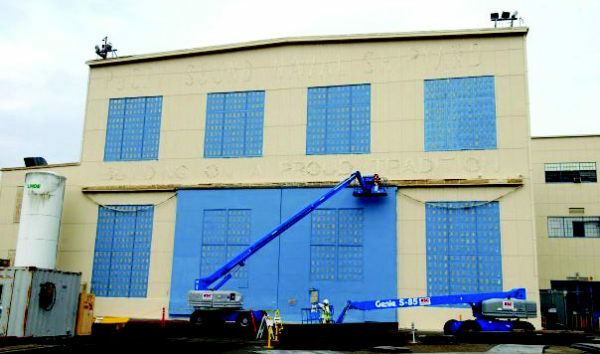 This was not just any paint job; but a chance to participate in the preservation of a historical landmark – benefiting the Navy, City of Bremerton and the lives of everyone who worked within or passes by this remarkable structure. By utilizing encapsulation as a mitigation method, the environmental challenges of the asbestos and lead-based paint were addressed while the restoration of the authentic original appearance of Building 460 was faithfully restored. The ability to achieve these goals simultaneously via encapsulation was acknowledged by all parties as the method that made the project possible within schedule and budget.